'Nowhere, beloved, can world be but within us' Rainer Maria Rilke (1875-1926) is one of the leading poets of European Modernism, and one of the greatest twentieth-century lyric poets in German. From The Book of Hours in 1905 to the Sonnets of Orpheus written in 1922, his poetry explores themes of death, love, and loss. He strives constantly to interrogate the relationship between his art and the world around him, moving from the neo-romantic and the mystic towards the precise craft of expressing the everyday in poetry. This bilingual edition fully reflects Rilke's poetic development. It contains the full text of the Duino Elegies and the Sonnets to Orpheus, selected poems from The Book of Images, New Poems, and earlier volumes, and from the uncollected poetry 1906-26. 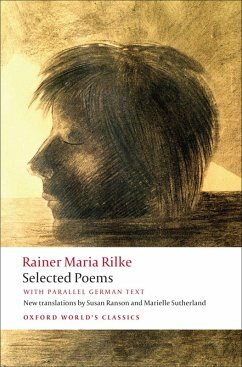 The translations are accurate, sensitive, and nuanced, and are accompanied by an introduction and notes that elucidate Rilke's poetic practice and his central role in modern poetry. ABOUT THE SERIES: For over 100 years Oxford World's Classics has made available the widest range of literature from around the globe. Each affordable volume reflects Oxford's commitment to scholarship, providing the most accurate text plus a wealth of other valuable features, including expert introductions by leading authorities, helpful notes to clarify the text, up-to-date bibliographies for further study, and much more.